If you're keeping track at home, this is the second Fierce Feathered Star quilt I've finished so far. :) The first one has a very different look. What better way to test measurements and instructions than making the pattern NINE times? I felt like I got the process down to a science while making the last few blocks. To keep the making more interesting, I decided to pick a different combo of blues and greens each time. I really didn't know how or IF the quilt would have a cohesive look when I was done, but it was interesting! I think the result is fun and more interesting than if I would have used the same color scheme again and again, which honestly felt like the safer choice to me. I did make some color decisions before beginning the first block. I decided that I was going to use the same gray background fabric throughout. I also decided I would use just 3 "main" (aka non-background) fabrics for each star. The last thing I kept consistent was the use of the white fabric as a secondary background in each star. Once I made the aforementioned color decisions, I sat down and made each block one at a time, I worked at a pace of about one star per day. Once I had all of the blocks done, I arranged and rearranged them on my design wall until I was happy with the color distribution across the top as a whole. I wanted each block to stand out on its own. For that to work, I decided that there needed to be some space between each block. The sashing strips and borders helped to make each star independent and pronounced. I'm attaching a diagram of how I add sashing strips and borders to quilts. For this quilt, I cut four sashing strips and positioned one on each side as shown in the diagram above. Then I sewed one sashing strip to the first two blocks and two sashing strips to the last block. Next, I sewed those sashing strips and blocks into a row. Then, I repeated that process until I had 3 rows. After my rows were complete, I pieced and cut long border/sashing strips exactly to the measurement of the rows. Four were needed for this quilt and btw: both the vertical and horizontal sashing strips are the same width. As far as handling bulk, I find it easiest to pin the long border strip to one row and then seam. Repeat until all long sashings are sewn. One row will need a long strip sewn to both the top and bottom edges. Then I sew the rows (with sashing attached) to each other to form the quilt top. Interactive coloring! From a smart phone, save one of these blank diagrams for coloring in the Recolor app. Click here for full instructions in this tutorial (with video). 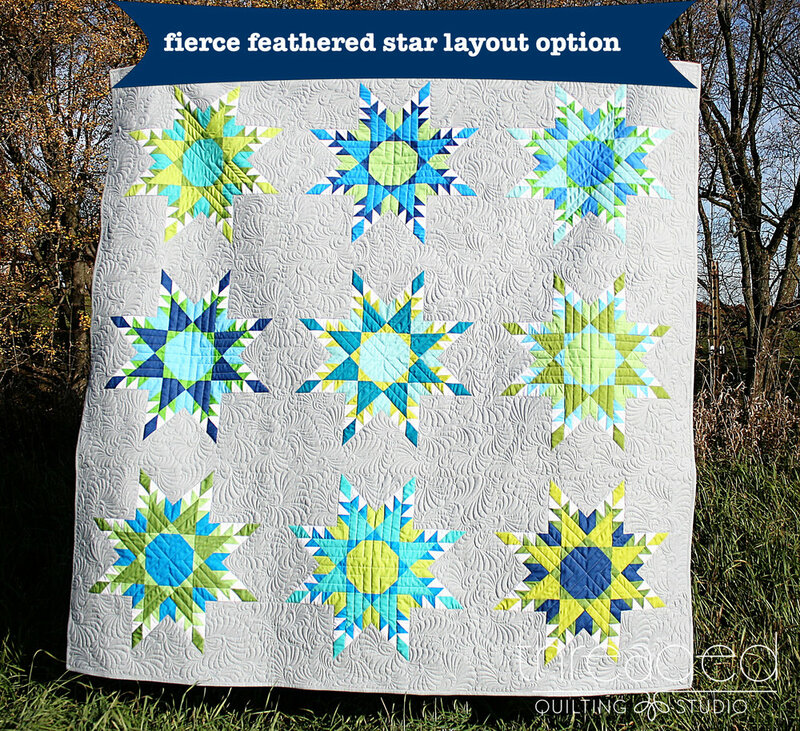 How would you color your Fierce Feathered Star? Click here to download a complimentary coloring page PDF for the Fierce Feathered Star for printing. As we all know, the quilt isn't done when the top gets assembled! I can't leave you without giving you a little more about the quilting, it's my favorite part! I decided to quilt lines within the stars. Because there is already a lot going on in the piecing and in the background quilting, I wanted the stars themselves to have strong-but-uncomplicated contrasting lines. Every other star has diagonal lines and its neighbor has vertical and horizontal lines. I used a marker (the pink air-soluble marker on my list of quilting tools) to draw the lines first and then used a longarm ruler + baseplate extender to actually quilt the lines out. Last but certainly not least, let me talk about the background quilting! I have a video tutorial with step by step instructions on how to draw this out, it's called paisley feathers. You can even print your own PDF tracing sheet to draw along with me as I walk through the process.